As an Eagle customer, you can expect your clothes will be treated by the most knowledgeable, professional and caring staff in the area. They care, and their pride shows in every garment they handle. We are also a select GreenEarth cleaning provider, the most advanced sustainable dry cleaning system in the industry. Your clothes are cleaned in an eco-friendly, odor free, non-toxic cleaning solution. Better for you, your clothes, our employees and our planet. Our Shirt Services are clearly the best in Rochester, recommended by leading local clothiers. We know you will like the convenience of our other services as well, like – Free Pick Up & Delivery, Same Day Service, 24 Hour Drop Box, Mobile App, Customer Rewards and most of all, the feeling your business is appreciated! 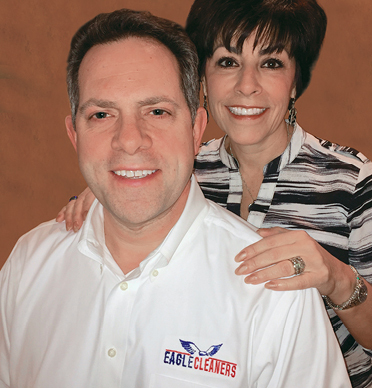 We look forward to showing you why Eagle Cleaners is the Best Dry Cleaners in Rochester, NY and our outstanding customer service staff of – Sandy, Chelsea, Lisa, Debbie and Ashley look forward to meeting you.